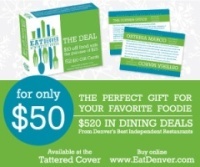 So I have to admit, when I caught wind of what was going on with the newest restaurant in Denver called Linger, I was a little intrigued in an apprehensive sort of way. 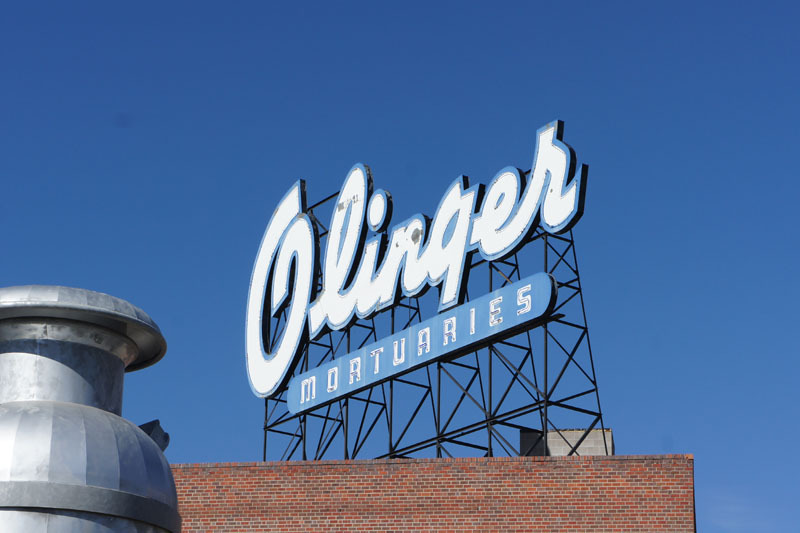 I couldn't quite justify my confusion, but perhaps it was the fact that the invitation came on a toe tag, and that the restaurant logo read 'Olinger Mortuary' (Look closely there's a 'linger' in there...). Cute in it's own morbid way, right? I was personally left with questions. Deep, existential questions. I.E. did my friends from Root Down really open a restaurant in a re-purposed morgue? Is that weird? Answer: Yes and yes. The name Linger does derive from the fact that the restaurant was opened in the former Olinger Mortuary, and is housed in what used to be the garage. But don't worry, it's been a while since this building was actually purposed as such, and the folks did a terrific job remodeling it. 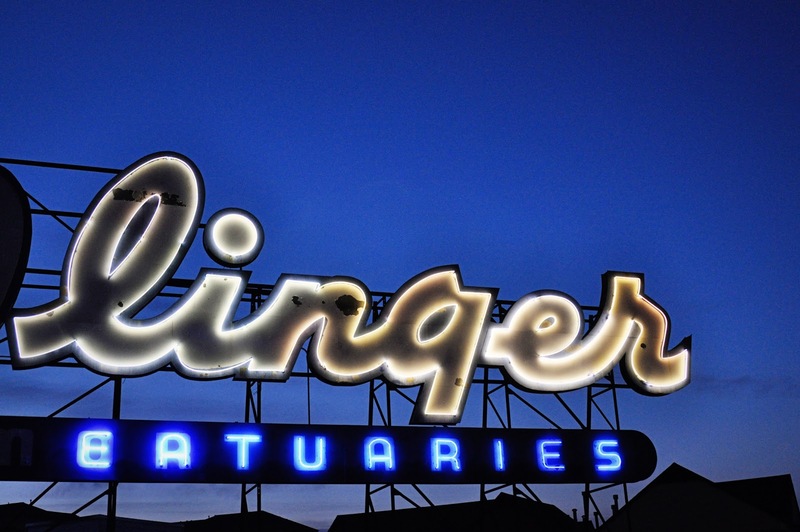 You would truly never know, aside from the fact that if you've ever walked around LoHi clamoring for a tequila shot at Lola or a cone at Little Man Ice Cream, you have likely noticed the giant Olinger sign that is still parked prominently on top of the building. 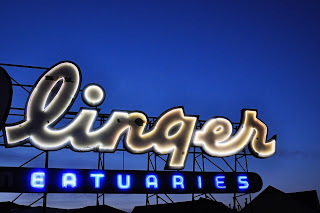 Historically, this sign remains as a taste of the past and continues to adorn the Highlands with character and hip craziness, and now creatively reads 'Linger Eatuaries'. So when Justin Cucci and team had an opportunity to pursue their encore to Root Down (that is also hip crazy), I'm assuming they couldn't pass up the prime location. And I don't blame them. As we walked in, the restaurant was anything but dead. Rather, it was lively, modern, and unique. The hostesses were pleasantly welcoming, and showed us to what they considered to be 'the best seat in the house'. But with a hilltop perch in the Highlands, we weren't the only ones. The view of Downtown from our table. Panning left: the Little Man milk jug. Our server welcomed us with some delicious, fancy water (reverse osmosis or something like that) that was highlighted with a profile of oxygen and an undertone of hydrogen. So glad they printed the recipe on the bottle so I can make it myself. We then eased in comfortably with everyone's favorite snack food ... (this is the 'bread and butter', a different flavor every day). ...and of course some cocktails to wash it down. The Quintess Manhattan- goes down like buttah. A bustling, open kitchen is the centerpiece to the main dining room; chef connects with guest as the energy flows across the restaurant and you take part in the smells and sounds of the food. Of course, that's what it's all about: THE FOOD. Now consider this a fair warning- Linger doesn't present a typical menu. But rather, our server helped us understand the international, small-plate format with a 'farm to street' focus. In what is a very eclectic, diversely-ethnic offering, Cucci offers a few bites from each of many different cultural categories that highlight his world travels and experiences with street food. "What I appreciate about street food in other countries," Cucci explains, "is that the cooks don't go to culinary school. They make great food - on the street - that people enjoy. I love the simplicity and humility of that." Cucci brings that mentality back to Denver and puts a complex spin on it. Needless to say, he takes you on a journey, and I was thankful that they broke it down into manageable chunks because ultimately it's easier to get 'one of each'. You can just get one dish from each region instead. Saag Paneer Fries- with a rhubarb catsup and a garlic spinach sauce that blends the whole thing together. Each element is complementary, and creates a wildly good concoction of texture and flavor. Maple Leaf Duck Wings- shaved fennel, blood orange hot sauce, and celery root ranch. Maybe a fork and knife wing (a sacrilege, I know) but all the better to tackle the fennel and get a balanced bite. Bhel Puri- a South Asian dish that's sort of a melting pot of flavors and textures. Spicy, sweet, crunchy, and though not my favorite dish of the night was certainly a unique offering. The Linger Burger with too many trimmings to list, but man was it good. Don't skip on this one. Doner Kebab Salad- a fresh spin on a classic Turkish sandwich. I ate my way through Europe on those things, so seeing avocado on this dish was different, although welcome. Probably my favorite dish of the night- Mussels simmered in a Strongbow Cider broth, served with cheddar-jalapeno bread. And finally... Espresso Chocolate Mousse with lemon foam and crispy donuts to simmer the palate. So if there's anything I can say to sum up an experience at Linger, it'd be that you'll find dishes here that expand your culinary horizons. With so many flavors, textures, and interesting techniques from top to bottom, you have to savor each bite and use the menu as a roadmap as to where you're going next. The ultimate goal is that you find yourself slowly moving your way through the night, in order to create your own experience that will linger with you for some time. Cucci's concept is truly a showcase of international delight, and though there's a lot going on they do a nice job executing so many elements. With service that is attentive and natural, the experience flows and wraps up nicely. So as you venture out for your night at Linger, make sure you show up with an open mind, an empty stomach, and plenty of friends for this awesome social dining experience. Dish It Up! I think that the mortuary was looking for a good meal for their employees.